This Recurring Payments module makes it possible for your customers to sign up for recurring subscriptions while purchasing from your digital shop. Note: Customers are required to be logged into an account on your site to purchase a subscription. If the customer does not have an account, you can allow registration at checkout by configuring your checkout form to display the registration form (Downloads -> Settings -> Misc [tab] -> Checkout [section]). To streamline the account creation process at checkout, consider using Auto Register which will disable the registration form on checkout and use the customer's purchase information to automatically create an account. Recurring Payments and Auto Register can be used together. 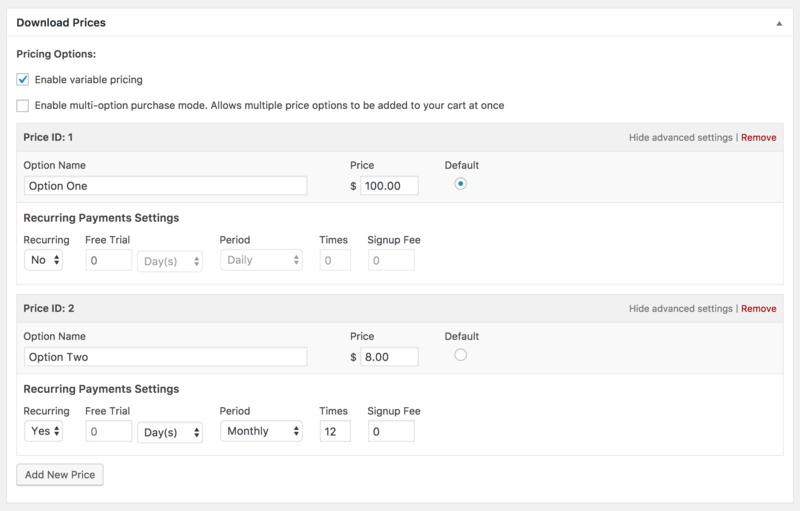 Any product can be quickly turned into a subscription product with just a couple of options added to the Configuration screen. Subscriptions can be set up to recur daily, weekly, monthly, or yearly, and can also be set to recur infinitely or for a set number of installments. Flexible Recurring Payments – Easily set up recurring payments on any product. You can easily adjust the recurring periods, the number of times they recur, and how much they cost. Products with variable pricing can have recurring and non-recurring price options. Currently, the available recurring periods are Daily, Weekly, Monthly, and Yearly. Multiple Subscriptions – Customers can have any number of subscriptions on their account. One, two, or even fifty. Customer Emails – Deliver automatic emails to customers when their subscription is nearing renewal, a renewal has been processed, a subscription has been cancelled, a renewal payment fails, and more. Signup Fees – You can set up optional signup fees. For example, charge subscribers $50 for the first month followed by $20 for every month after. Subscription Management – With a complete interface for viewing and managing subscriptions, taking care of your customers and keeping an eye on your subscriptions is simple. Renewal Revenue Reports – Track your recurring revenue through beautiful and easy to read earnings graphs. Limit File Downloads – Optionally restrict file downloads of recurring products to just those customers with an active subscription. Discount Codes – Discount codes can be set up to apply to the initial payment only or to each and every renewal payment. Software Licensing integration– Recurring Payments is fully integrated with the Software Licensing to provide automatic license renewals anytime a subscription payment is recorded. Content Restriction integration – Recurring Payments is fully integrated with the Content Restriction to make it possible for you to restrict posts, pages, bbPress forums, etc, to only those users that have purchased specific products and have an active subscription that is not expired. Recurring Payments is supported by a wide variety of payment gateways (see below). Additional payment gateway support will also be coming soon.